Jordan Nicholson training after the Posh game againts Chesterfield. Photo: Joe Dent/theposh.com. New Peterborough United signing Jordan Nicholson has swapped working with old folk for working with some of the brightest young professionals in the Football League. The 21 year-old was a care co-ordinater for the elderly until signing a two-and-a-half year contract at the ABAX Stadium on Christmas Eve. And his arrival at Posh completes a meteoric rise up the Football League ladder. Nicholson, who originates from Godmanchester, was playing Cambs League football in the 2013-14 season before moving up to the United Counties League with Eynesbury Rovers and then onto Histon of the Southern Premier Division. Nicholson scored 16 goals for Histon in his first four months at the club. That earned him a trial at Posh and within four more days he’d become a League One player. He sat on the substitutes’ bench for the Christmas fixtures against Chesterfield and Walsall. That’s a rapid rise of seven levels in 18 months. “It’s been a hectic couple of weeks,” Nicholson said. “The dream has always been there to play professional football, but for it to happen so quickly is incredible really. “I only moved to Histon in the summer. It went really well and my confidence grew as I scored some goals. The next thing I know I’m at Peterborough and signing a professional contract. I’ve been pinching myself every day since as I am in the same dressing room as some idols. “But I only have to look across the room at Conor Washington to see what can happen if you work hard. He’s from the same area as me and played at the same level for St Ives and now look at him. “I’ve actually found it quite hard working full-time and then playing football so now I will just get my head down, work hard and see where it takes me. That’s what the manager has told me to do and if I impres I will get my chance. “I have a fairly long contract, but I want to start strongly. “Everyone knows what Peterborough have done with young players in the past and I hope they can improve me as a player as well. 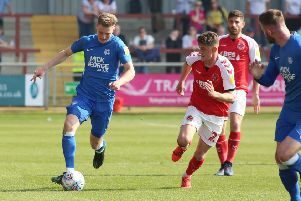 Manager Graham Westley believes Posh fans will love watching Nicholson play.